Habib Mostafaei. 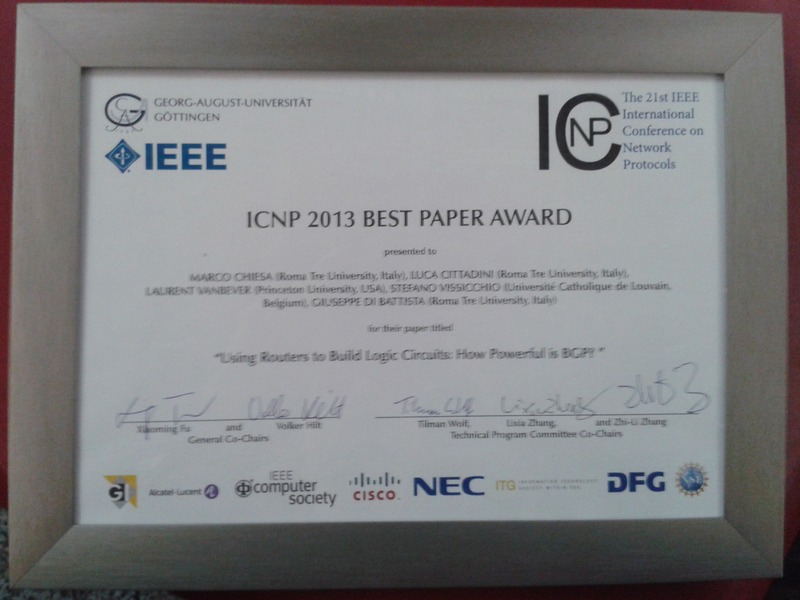 Energy-Efficient Algorithm for Reliable Routing of Wireless Sensor Networks. IEEE Transactions on Industrial Electronics. 119(7):5567-5575. 2019. Luca Marzialetti, Massimo Candela, Giuseppe Di Battista. Upstream Visibility: A Multi-View Routing Visualization . In, Karsten Klein, Yi-Na Li, editors, VINCI '18 Proceedings of the 11th International Symposium on Visual Information Communication and Interaction, 2018. Klaus-Tycho Foerster, Mahmoud Parham, Marco Chiesa, Stefan Schmid. TI-MFA: Keep Calm and Reroute Segments Fast. In Global Internet Symposium (GI 2018), IEEE, 2018. To appear. Valentino Di Donato. Graphs from the Internet: Analysis and Visualization of Large Dynamic Networks, Doctoral Thesis, Roma Tre University, Department of Enginering, Ph.D. in Computer Science and Automation Engineering, XXIX cycle, 2017. Marco Di Bartolomeo. 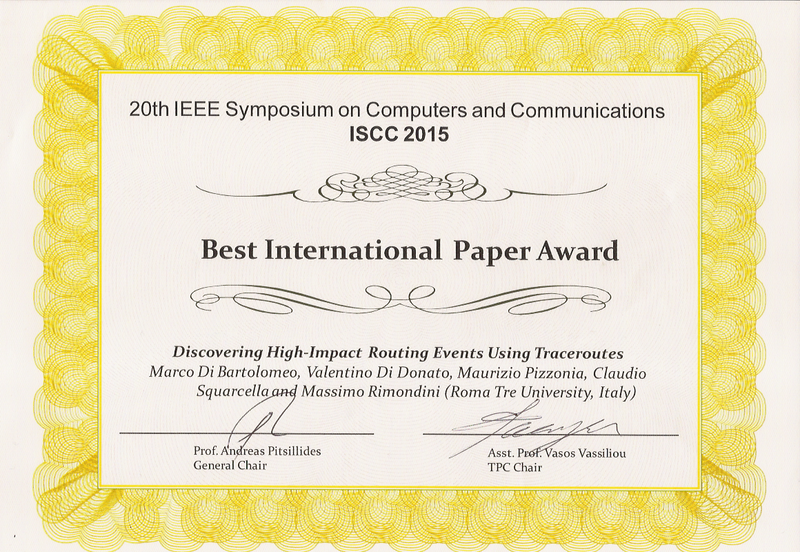 Visual Analytics of Network Routing Through Traceroute Data: Models and Techniques, Doctoral Thesis, Roma Tre University, Department of Enginering, Ph.D. in Computer Science and Automation Engineering, XXVIII Ciclo, 2016. Federico Griscioli, Maurizio Pizzonia, Marco Sacchetti. Metodo e apparato per la protezione di apparecchiature elettroniche con interfaccia USB da attacchi che emulano un human interface device (Method and device for the protection of electronic devices with USB interface from attacks that emulates a human interface device). IT patent pending. 2016. Marco Chiesa, Christoph Dietzel, Gianni Antichi, Marc Bruyere, Ignacio Castro, Mitch Gusat, Thomas King, Andrew W. Moore, Thanh Dang Nguyen, Philippe Owezarski, Steve Uhlig, Marco Canini. Inter-domain Networking Innovation on Steroids: Empowering IXPs with SDN Capabilities. IEEE Communications Magazine special issue on SDN Use Cases for Service Provider Networks. 54(10):102-108. 2016. Roberto di Lallo. Supporting End-to-End Connectivity in Federated Networks using SDN. First year examination PhD track. 2015. Marco Chiesa, Giuseppe Di Battista, Thomas Erlebach, Maurizio Patrignani. Computational Complexity of Traffic Hijacking under BGP and S-BGP. Theoretical Computer Science. 600:143-154. 2015. Stefano Vissicchio, Luca Cittadini and Giuseppe Di Battista. On iBGP Routing Policies. IEEE/ACM Transactions on Networking. 23(1):227-240. 2015. Marco Di Bartolomeo, Valentino Di Donato, Maurizio Pizzonia, Claudio Squarcella, Massimo Rimondini. Mining Network Events using Traceroute Empathy. Technical Report arXiv:1412.4074, Cornell University, 2014. Marco Chiesa, Ilya Nikolaevskiy, Aurojit Panda, Andrei Gurtov, Michael Schapira, Scott Shenker. Exploring the Limits of Static Failover Routing. Technical Report arXiv:1409.0034, Cornell University, 2014. Alberto Dainotti, Claudio Squarcella, Emile Aben, Kimberly C. Claffy, Marco Chiesa, Michele Russo, Antonio Pescape'. Analysis of Country-wide Internet Outages Caused by Censorship. IEEE/ACM Transactions on Networking. 22(6):1964-1977. 2014. Valentino Di Donato, Marco Di Bartolomeo, Maurizio Pizzonia. 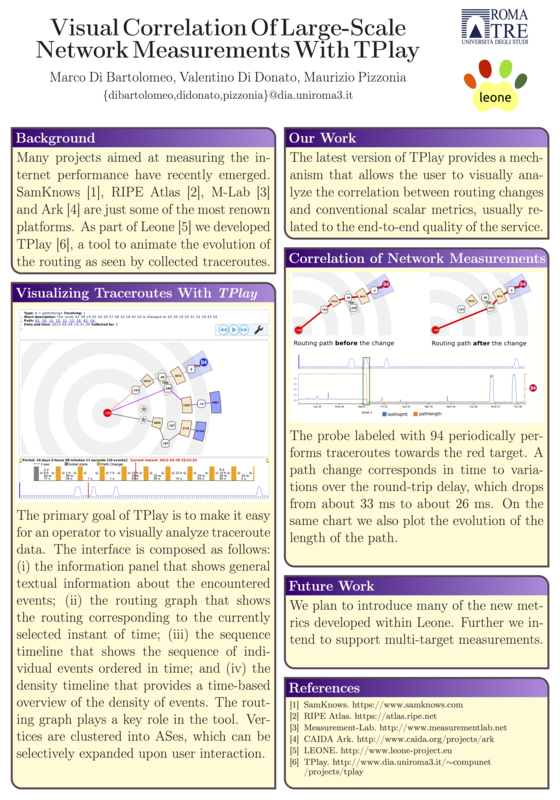 Visual Correlation Of Large-Scale Network Measurements With TPlay. In Proc. 23rd European Conference on Networks and Communications (EuCNC 2014), 2014. Poster. Massimo Rimondini, Claudio Squarcella, Giuseppe Di Battista. From BGP to RTT and Beyond: Matching BGP Routing Changes and Network Delay Variations with an Eye on Traceroute Paths. Technical Report arXiv:1309.0632, Cornell University, 2013. Stefano Vissicchio, Laurent Vanbever, Cristel Pelsser, Luca Cittadini, Pierre Francois, Olivier Bonaventure. Improving Network Agility with Seamless BGP Reconfigurations. IEEE/ACM Transactions on Networking. 2012. To appear. Marco Chiesa, Giuseppe Di Battista, Thomas Erlebach, Maurizio Patrignani. Computational Complexity of Traffic Hijacking under BGP and S-BGP. Technical Report arXiv:abs-1205-4564, Cornell University, 2012. Laurent Vanbever, Stefano Vissicchio, Cristel Pelsser, Pierre Francois, Olivier Bonaventure. Lossless Migrations of Link-State IGPs. IEEE/ACM Transactions on Networking. 2012. To appear. Stefano Vissicchio, Luca Cittadini, Laurent Vanbever, Olivier Bonaventure. iBGP Deceptions: More Sessions, Fewer Routes. In 31th IEEE International Conference on Computer Communications (IEEE INFOCOM 2012), IEEE, 2012. Stefano Vissicchio, Luca Cittadini, Laurent Vanbever, Olivier Bonaventure. iBGP Deceptions: More Sessions, Fewer Routes. Technical Report RT-DIA-189-2011, Roma Tre University, 2011. Laurent Vanbever, Stefano Vissicchio, Cristel Pelsser, Pierre Francois, Olivier Bonaventure. Seamless Network-Wide IGP Migrations. In SIGCOMM, ACM, pages 314-325, 2011. Laurent Vanbever, Stefano Vissicchio, Cristel Pelsser, Pierre Francois, Olivier Bonaventure. Seamless Network-Wide IGP Migrations. Technical Report , IP Networking Lab, Universite Catholique de Louvain, 2011. Gabor Bajko, Mohamed Boucadair, Steve M. Bellovin, Randy Bush, Luca Cittadini, Olaf Mannel, Reinaldo Penno, Teemu Savolainen, Jan Zorz. The Address plus Port (A+P) Approach to the IPv4 Address Shortage. RFC 6346, Internet Engineering Task Force, 2011.
bibtex:unpublished is not implemented Gabor Bajko and Mohamed Boucadair and Steve M. Bellovin and Randy Bush and Luca Cittadini and Olaf Mannel and Reinaldo Penno and Teemu Savolainen and Jan Zorz. The Address plus Port (A+P) Approach to the IPv4 Address Shortage. 2011. Luca Cittadini, Wolfgang Muehlbauer, Steve Uhlig, Randy Bush, Pierre Francois, Olaf Maennel. Evolution of Internet Address Space Deaggregation: Myths and Reality. Journal on Selected Areas in Communications. 28(8):1238-1249. Oct 2010. Giacomo Balestra, Salvatore Luciano, Maurizio Pizzonia, Stefano Vissicchio. Leveraging Router Programmability for Traffic Matrix Computation. In Proc. Workshop on Programmable Routers for Extensible Services of Tomorrow (PRESTO 2010), ACM, 2010. Giacomo Balestra, Salvatore Luciano, Maurizio Pizzonia, Stefano Vissicchio.. Metodo per la misura della matrice di traffico in reti di telecomunicazioni basate su pacchetti (Method to Measure Traffic Matrix in Datagram Based Telecomunication Networks. IT patent pending May 2010, RM2010A000279.. 2010. Luca Cittadini, Valerio Mezzapesa, Maria Luisa Papagni, Maurizio Pizzonia, Luca Vergantini, Stefano Vissicchio. Beyond the Best: Real-Time Non-Invasive Collection of BGP Messages. Technical Report RT-DIA-165-2010, Dept. of Computer Science and Automation, Roma Tre University, 2010. Anja Feldmann, Luca Cittadini, Wolfgang Muehlbauer, Randy Bush, Olaf Maennel. HAIR: Hierarchical Architecture for Internet Routing. In Proc. Workshop on Re-architecting the Internet (ReArch '09), ACM, 2009. Maurizio Pizzonia, Stefano Vissicchio. Test Driven Network Deployment. Technical Report RT-DIA-143-2009, Dept. of Computer Science and Automation, Roma Tre University, 2009. Luca Cittadini, Massimo Rimondini, Matteo Corea, Giuseppe Di Battista. On the Feasibility of Static Analysis for BGP Convergence. In Proc. 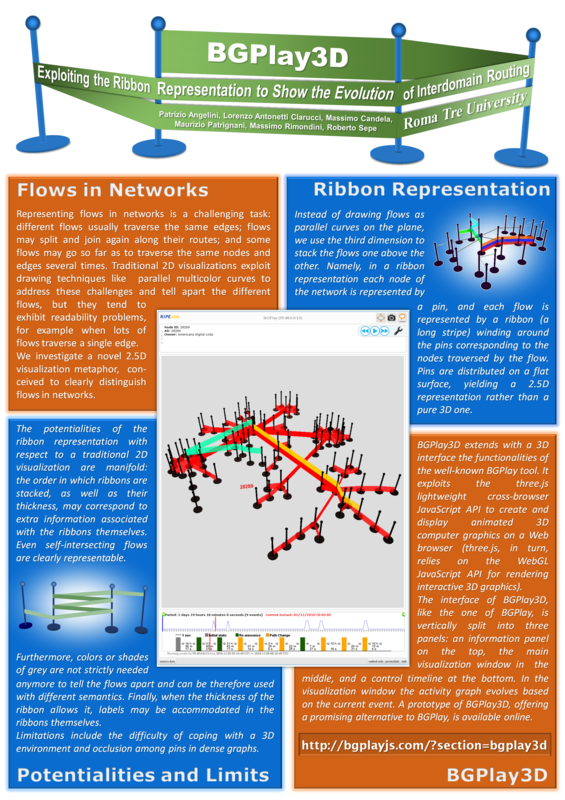 International Symposium on Integrated Network Management (IM 2009), IEEE, pages 521-528, 2009. Anja Feldmann, Randy Bush, Luca Cittadini, Olaf Maennel, Wolfgang Muehlbauer. HAIR: Hierarchical Architecture for Internet Routing. Technical Report 2008-14, Technische Universitaet Berlin, 2008. Olaf Maennel, Randy Bush, Luca Cittadini, Steve M. Bellovin. A Better Approach than Carrier-Grade-NAT. Technical Report CUCS-041-08, Dept. of Computer Science, Columbia University, 2008. Luca Cittadini, Giuseppe Di Battista, Massimo Rimondini. (Un)-Stable Routing in the Internet: A Survey from the Algorithmic Perspective (Invited Lecture). In, H. Broersma, T. Erlebach, T. Friedetzky, D. Paulusma, editors, Proc. International Workshop on Graph-Theoretic Concepts in Computer Science (WG 2008), Springer-Verlag, volume 5344 of Lecture Notes in Computer Science, pages 1-13, 2008. Luca Cittadini, Giuseppe Di Battista, Massimo Rimondini. How Stable is Stable in Interdomain Routing: Efficiently Detectable Oscillation-Free Configurations. Technical Report RT-DIA-132-2008, Dept. of Computer Science and Automation, Roma Tre University, 2008. Alexander Heitzmann, Bernardo Palazzi, Charalampos Papamanthou, Roberto Tamassia. Effective Visualization of File System Access-Control. In, John R. Goodall, Gregory Conti, Kwan-Liu Ma, editors, Proc. 5th International Workshop on Visualization for Computer Security (vizSEC 2008), Springer-Verlag, volume 5210 of Lecture Notes in Computer Science, pages 18-25, 2008. Claudio Biancalana, Alessandro Micarelli, Claudio Squarcella. Nereau: A Social Approach to Query Expansion. In Proc. 10th ACM Workshop on Web Information and Data Management (WIDM 08), ACM, WIDM 08, 2008. Massimo Rimondini. Interdomain Routing Policies in the Internet: Inference and Analysis. 2007. PhD Thesis defense. Giuseppe Di Battista, Bernardo Palazzi. Authenticated Relational Tables and Authenticated Skip Lists. In Proc. Working Conference on Data and Applications Security (DBSEC'07), pages 31-46, 2007. S. Lo, R. K. C. Chang, L. Colitti. An Active Approach to Measuring Routing Dynamics Induced by Autonomous Systems. In Experimental computer science on Experimental computer science (ECS'07), USENIX Association, pages 21-21, 2007. Massimo Rimondini. Emulating Computer Networks with Netkit. 2006. tutorial held at the 4th International Workshop on Internet Performance, Simulation, Monitoring and Measurement (IPS MoMe 2006). Giuseppe Di Battista, Bernardo Palazzi. A method of dynamic and secure managing of a relational table in a database. IT patent pending Sep. 2006, PCT/IT 2007/000654. 2006. P. Giacomazzi, A. Lapiana, G. Mulas, L. Musumeci, G. Paltenghi, M. Pizzonia, D. Ragazzi, I. Sartini, G. Verticale. 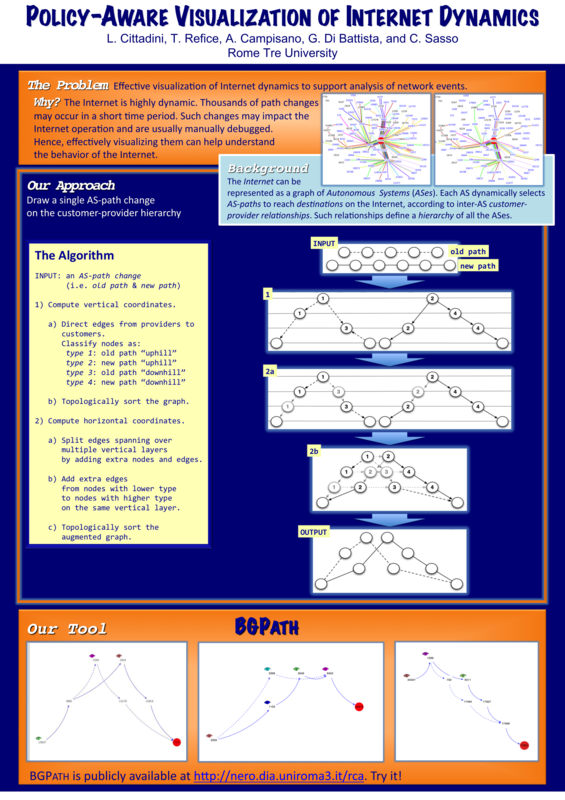 Adaptive Networks. In, Barbara Pernici, editor, Mobile Information Systems: Infrastructure and Design for Adaptivity and Flexibility, Springer Berlin Heidelberg, pages 117-153, 2006.